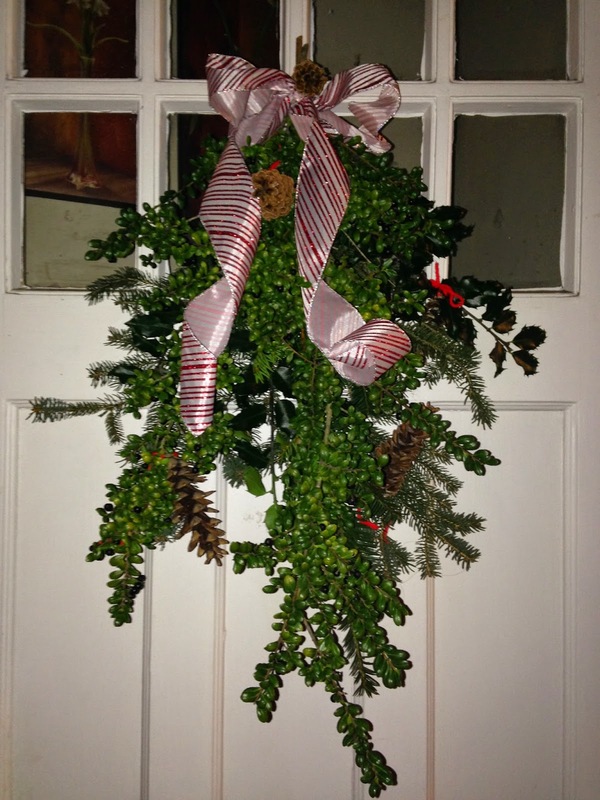 An easy, fun, and beautiful activity for children and adults, too - clusters of evergreen branches, secured tightly with a rubber band, then with green wire. Create a loop with the wire so as to hang it easily on an outside door. We added our own wired ribbon bows, some pine cones we had gathered and voilà - a lovely door decoration created during our middle school Garden Club activity. You can use any kind of evergreen as well as dried stems from perennials like artemesia and sea grasses. Be whimsical. 'tis the season. Just came across DC Greens. How to get vegetables to an urban population- compliments of Lauren Shweder Biel. Over the summer months, DC Greens worked with the Department of Health to implement their Produce Plus program. Operating with municipal funding, Produce Plus allows any DC resident on Medicaid, SNAP, WIC, and other federal benefit programs to get $10 in market dollars per week to purchase produce at the city’s farmers markets. The demand for this program was astonishing. Markets across the city saw lines around the block on a weekly basis! 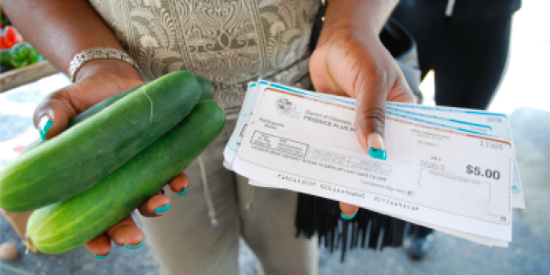 DC Greens spent the fall analyzing the data for the program, and we are thrilled to report that $167,000 went out to help low-income customers buy local produce. In addition, the program brought new customers to markets, resulting in a city-wide increase in SNAP (food stamp) purchases at farmers’ markets. We are so proud of the city for investing in nutrition incentives at farmers' markets, and thrilled that the program was met with unequivocal demand from the customers who need it the most. This week marks the end of our 2014 Fruit and Vegetable Prescription Program season. For the past six months, patients at four Unity Clinics across the city have received prescriptions from their doctors to redeem for free produce at any of 40 farmers markets across the city. This season, 78 patients and their 173 family members benefited from the program, which DC Greens runs in partnership with the Department of Health and Wholesome Wave. We’ll be analyzing the health data in the coming months, but from our initial review we expect the same strong results that we’ve seen in past years, with drops in Body Mass Index (BMI) and increases in well-patient visits among patients at high-risk for obesity related chronic illnesses. peppers, etc., to make room for cool weather crops. And remember to leave space for garlic in October. Dig, Plant, Grow- a guide to planning your own garden curriculum written by teachers Meredith Hill and Sarah Ohana. Here's a link to their perfect little booklet that addresses many ways to bring the garden into the curriculum and the curriculum into the garden. It is scientific, doesn't "talk down' to anyone, and will enrich your understanding of the processes needed to make your gardens grow and flourish. Download free, enjoy, share. Perfect timing for summer reading and inspiration. What fun! Here's a look at the potato towers at the Stamford Museum and Nature Center. Constructed by Will Kies, Director of Education and Heckscher Farm, they are already leafing out. Will did 4 nests per tower. And the most fun part - harvesting! Kick the tower and out roll lots of potatoes. No blemishes from digging tools. Just beautiful, perfect potatoes. The Stamford Garden Club sponsored the 4th Annual lettuce Challenge for the GIVE schools in Stamford. Tiny buttercrunch lettuce plugs were distributed to 16 schools and over 700 students on April 1st. Six weeks later, on May 12th, the 3 best entries from each class or club (over 100) were picked up by the Stamford Garden Club, delivered to the Government Center, and were judged. The best plants in each group were awarded a blue ribbon. The Best in Show went to an entry from Dolan Middle School: perfectly formed, rosette shape, dense center, and dark green in color. It had been grown "au naturel". The student planted the tiny plug in the designated pot with the potting soil provided. He placed the pot into his garden bed, surrounded by soil to keep it warm, watered occasionally, and, as he said, "I just let it grow." Some entries were grown under gro-lights, some in windowsills, some in mini-greenhouses made from milk jugs. But, "best in show" was done in the most natural and simple way. Next step: back into the garden beds to be allowed to grow full size. Soon to be a salad! Enjoy the link to a video from the recognition day, May 14th.